She starts “to be perfectly honest” – thus starting already by being none objective! “I was curious to see if it really was the best thing since the proverbial sliced bread, or rather one of the many rather undistinguished releases that seem to be a dime a dozen on the current prog scene” – big empty words in a complete useless sentence. “a long-dead band”. 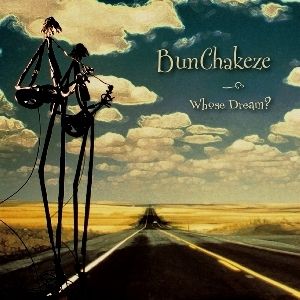 – Not only BunChakeze’s obvious enthusiasm brought this album to the attention of many, the album was enthusiastically well received and liked by many prog and none prog listeners alike spreading to other listeners, has been played repeatedly on many prog/rock and other radio stations and received many great reviews thus bringing even greater curiosity and anticipation to others who have not heard the album. If this reviewer had done her research this band, never really tried to take it to the next level, since all band members only recorded the album and thereafter went their separate ways into their daily life and carriers, they never even performed live thus couldn’t die in the first place?”. “and Joey Lugassy’s voice sounds positively strained at times” – again this is personal opinion not being objective as it says nothing about his singing abilities/skills which have been closely compared to Peter Gabriel’s by many critics. “Whose Dream? shows a distinct lack of sprawling epics –a refreshing change of pace from the often overambitious efforts that seem to be the rule these days. Some of the compositions, in spite of their relative shortness, do have an epic scope of sorts: “Flight of the Phoenix” and “Midnight Skies” (dedicated to the plight of Native Americans) both offer enough tempo changes (though never in an overly complex fashion) and instrumental interest to qualify as mini-epics” – with comments like this one could think that the author is reviewing a alternative rock album. “perhaps reflecting the frustration the band members were experiencing at the time the music was composed” – this again is just speculation and total opposite feeling one gets from previous statements written in articles the Band members saying they were creating something that they really liked playing, enjoyed without any pressures including financial or having to compromise in succeeding in what the trend or music industry demanded at the time. “As the band members themselves are ready to admit, the biggest influence on BunChakeze’s sound are Pink Floyd” – this again is just speculation and total opposite feeling one gets from previous statements written in articles the Band members saying they were creating something that they really liked playing, enjoyed without any pressures including financial or having to compromise in succeeding in what the trend or music industry demanded at the time. “As the band members themselves are ready to admit, the biggest influence on BunChakeze’s sound are Pink Floyd” – not the biggest, they stated that Floyd was an influence. Raffaella is one of the best progressive rock reviewers nowadays, sadly, her objective/subjective (as you want to see it) point of view may not please the followers of the band/album she reviews. She is always well informed and cares about what she is writing, I mean, she will never have the irresponsibility of writing without prior documentation and of course, without having carefully listened to the albums a considerable amount of times. We (people) are very different, and will never please everybody, but after reading this review, I do have a clue of what “Whose Dream?” sounds like, and am actually interested in the album. My first sentence was written out of context, unfair to the reviewer and also out of character on my behalf. Would I have known progmistress was Raffaella, I would have read this review with an open mind and especially not mentioned the word clueless. Obviously the Reviewer has the right to say what she thinks of the album although some where quite positive, others seemed quite contradictory to me and I quote – However, it is definitely no worse than many current releases frequently hailed as near-masterpieces beyond their true merits. Thus quite confusing for me, as the reader. Reading all this again, I must say that I stand by what I initially said, this review is nothing but a pompous attempt by the reviewer to impress other reviewers. It’s self-righteous and really bad in terms of a review of what the music might sound like to the reader/listener or prospect buyer.